Online poker is only currently allowed in three US states, those being New Jersey, Delaware and Nevada, with New Jersey being the largest of the three regulated markets, and home to a few big names in poker networks including: 888.com, WSOP.com, Borgata, Party and PokerStars NJ. 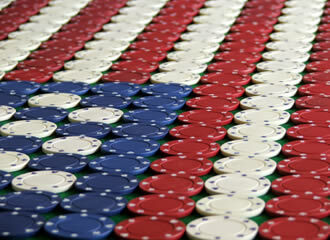 PokerStars made its return to the US online poker market only this year (March) and became an instant market share leader, taking away some royalties from opposition sites, although for some poker players the product is not quite hitting the mark, with many staying loyal to their other sites since PokerStars made big changes which included those VIP alterations that hit the High Stakes players and saw some actually boycotting the site in protest, although it should be mentioned that the increased overall liquidity, rejuvenated promotional efforts besides a greater game selection proved well for the majority of poker players. Finding a new site to play at whether it is finding a new casino, poker or even finding new bingo sites can be daunting. It is always the wise player who does some research before opting into any one site and this is because competition is high within the industry and so sites offer some really good deals to tempt you through their virtual doors. Checking one of the many comparison sites you can find online will take much of the hard work out of finding your perfect site to play at, one that suits your tastes and individual style the best. These comparison sites work in much the same way as any other comparison site would if you were looking for the best deal for car insurance or house insurance for example. After New Jersey, Nevada is the second largest state which offers regulated online poker and is dominated by WSOP.com Nevada also is the one of the three that offers poker without any casino games whatsoever. That leaves Delaware which is the smallest online poker market of the three, but it is hoped that a newly signed liquidity agreement with Nevada will build the numbers. Delaware at present only operates a single online poker site and each of the three authorized brands feed into this site providing online games to the people of Delaware. There are four other states that have active legislation which might let them offer legal and regulated US online poker and casino games and theses are Michigan, California, Pennsylvania and New York. Out of the four states mentioned above it appears that Pennsylvania has the best chance of passing the bill this year, albeit after a shaky start to this year’s efforts. In mid-July Governor Tom Wolf allowed a spending plan to become law, but any expanded gambling legislation which is expected to include language that will lead to the legislation of online poker and casinos will not be voted on until the autumn when the state Senate returns from recess, but the odds are strongly in favour of regulated online gambling finally becoming a reality, and hopefully this year.